I love fish, but no one else in my family likes it, so I never got in the habit of preparing it often at home. When I took the Mediterranean Diet Quiz, it was my biggest shortfall and something I'm working on during our challenge. My friend, Laura, manages to cook and eat a lot more fish than I do. We've dined on fish she caught herself and frozen stuff from Costco. She makes it all taste delicious. So, I asked her to share some tips with us. I'm also relying on the seafood folks at my neighborhood Whole Foods market. They're very helpful and share my interest in sustainability. Check out their 12 Easy Fish Feast recipes. I've been enjoying the almond encrusted Tilapia from that recent Washingtonian article too. The health benefits of fish are numerous … fish is a low-fat, high quality protein packed with omega-3 fatty acids, vitamins and nutrients that can reduce the risk of a heart attack or stroke. Fish is an excellent source of calcium and minerals. The American Heart Association recommends eating fish at least two times per week. Fish is packed with protein, vitamins, and nutrients that can lower blood pressure and help reduce the risk of a heart attack or stroke. The Washington State Department of Health lists the healthiest fish with the highest health benefits in this link: Healthy Fish Guide. Omega-3 fatty acids are the unsaturated fats contained in fish and are important in maintaining healthy brain function and a healthy heart by lowering blood pressure, reducing the risk of heart attacks, sudden cardiac death, strokes and irregular heart rhythms, among other things. Our bodies do not produce omega-3 fatty acids so we need to get them through food we eat. Omega-3 fatty acids are found in all fish, but are especially high in fatty fish such as salmon, trout, sardines, canned light tuna and oysters. There is also research indicating that omega-3 fatty acids may reduce the risk of depression, ADHD, dementia, diabetes and Alzheimer’s disease, and may prevent inflammation and the risk of arthritis. Mayo Clinic indicates that eating one or two servings of fish a week can reduce your risk of dying of a heart attack by more than a third. The American Heart Association has long recommended that we eat at least two servings of omega-3-rich fish per week. What about the contaminants contained in fish? The health benefits of eating fish outweigh any associated risks such as the risk of ingesting mercury or other contaminants. The amount of toxins in fish depends on the type of fish and where it's caught. Generally speaking, the larger the fish, the higher the level of mercury and other contaminants. Larger fish in the food chain such as shark, swordfish and king mackerel tend to have higher levels of mercury than do smaller fish -- larger fish eat smaller fish, gaining higher concentrations of toxins. Additionally, the longer a fish lives, the larger it grows, and the more mercury it can collect. Many researchers believe that wild-caught fish is healthier than farm-raised fish due to potential harmful effects on people the antibiotics, pesticides and other chemicals used in farming fish can have. The following is a recipe for my favorite way to prepare my favorite fish, Salmon. 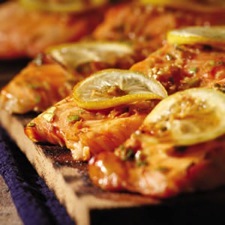 Place the lemon slices and salmon in the Ziploc bag or bowl allowing the marinade to cover the filets. Marinate for at least 30 minutes but no more than 1 hour, turning the fish in the marinade once or twice. Remove the salmon from the marinade, place it skin-side down on the hot grill. Close the lid and cook for approximately 5 to 7 minutes. Turn the fish carefully and replace the lemon slices on top at this point, if desired. Close the lid and cook until the fish is just cooked through, about 5 to 8 more minutes. Drizzle olive oil lightly in the skillet, or use a cooking spray. Preheat the skillet to medium high. Remove the salmon from the marinade, place it skin side down on the hot skillet and cook about 5 minutes. Carefully turn the salmon, place the lemon slices on top, and cook the other side until done.